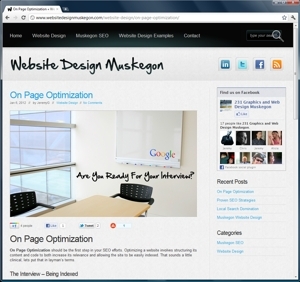 Website Design Muskegon is a website design blog that I started in the first week of 2012. I started this site for a few different reasons. First off I thought it was really important to show my web design skills using content management systems. This is a wordpress site, utilizing a free skin (Boldy) which is very simple, yet has all of the features needed to create a great web design blog. As you can see by the look of the site, it’s very clean looking with some great social integration. Obviously, since I am an experienced designer, with PHP, HTML and CSS skills, I have added a couple of features that where not there before such as the social icons down the left side of the page. Once you know the code, making small additions like that are not only easy, but can add to the user experience. The real powerful features of the site where there in the first place, if you set up with a good permalink structure and add the appropriate plug-ins, you’ll be ready to rock and come out of the gate swinging! I started this site and added about 6 posts before I added the sitemap and turned it on to be indexed by Google, Bing and Yahoo. It ranked on first page for most of the relevant search strings that I was targeting within a day. It actually ranked first for many search strings on both Bing and Yahoo for the first week, sinking slightly in the second. Interesting since it did almost exactly what I expected!!! Over the next few months I will be adding a couple of articles per week, all related to SEO and web design, specifically focused on our work at 231 Graphics, as well as things related to Muskegon in general. Blogs can be a great addition. I went for a blog on a different URL for a couple of different reasons. For one I wanted to show the difference in the looks of a static site and a CMS (231graphics.com is static – websitedesignmuskegon.com is a CMS). 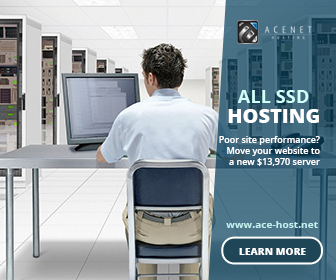 Another is I wanted a little more flexibility with this site then I have with www.231graphics.com. See I do not want to put anything on www.231graphics.com that is not specific to my work, or the work we have done on the behalf of our clients. 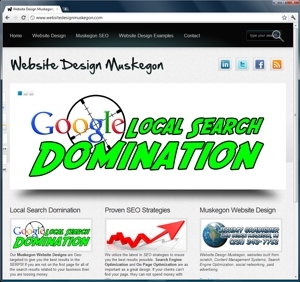 Now website design Muskegon allows me to just add random articles on website design and SEO in general, and not just my work or what has to do with my local area. It allows flexibility with added link juice power. Who could ask for more?